Northern Indiana Northern Indiana U-Pick farms: Find a pick your own farm near you in Northern Indiana for fruit, vegetables, pumpkins, organic foods,local produce and more! Looking for a local, pick-your-own farm in Northern Indiana? Scroll down this page and you will see the U-Pick farms in Northern Indiana, sorted by county. Those that offer organic or sustainably grown produce are identified by the words "organic" and/or "sustainable" in Green, next to their name (see "What does Organic mean?"). The U-pick crops they offer follow the name of the farm. To search the page for a specific crop, use Ctrl-F (or on an ipad or Mac, use their "search on this page" function) If they have a website, the name will be in blue and underlined; click on it and it will open their website. If you find anything outdated or inaccurate, see the customer and farmer menus (as appropriate) at the top menu bar to submit updates and corrections and help me keep each current! 12818 Edgerton Road, New Haven, IN, 46774. Phone: (260) 749-0891. Email: [email protected]. U-pick orchard opens mid- September. Monday through Friday 9:30am to 7:00 pm; Saturday and Sunday 9:30 am to 5:00 pm. Directions: Take Dawkins Road one mile east of New Haven then north on Doyle Road and east on Edgerton Road. Click here for a map and directions. Many varieties on dwarf trees. Apples are available already picked and washed as well. We also offer fresh cider and apple butter along with fresh produce, pumpkins and gourds. Our New Haven location is also home to our nursery, Advanced Tree Technology. Specializing in fast growing screen, shade and windbreak trees. Apples: Fuji, Empire, Spigold, Jonathon, Red Delicious, Golden Delicious, Ginger Gold, Ida Red, Cortland, Winesap, Rome, Honeycrisp, Mutsu, Paula Red, Red Free, McIntosh, Gala - note some varieties are not available for u-pick. Also Peaches, tomatoes, peppers, pumpkins and gourds. Click here for our Facebook page. 11709 Clay Street, Leo-cedarville, IN 46765. Phone: 260-627-5239. Email: [email protected]. Open: Sunday through Saturday from 8 am to 6 pm. Directions: From Interstate 69 North, take exit 316 Dupont Road. Turn left onto Dupont, continue into Leo-Cedarville. Clay Street is the first street on the right after the bridge. Click here for a map and directions. Strawberries starting June 5, Raspberries starting June 23, Blueberries starting July 5. Payment: Cash, Check, Debit cards, Visa/MasterCard, Discover. 8724 Huguenard Road, Fort Wayne, IN 46818. Phone: 260-489-3940. Email: [email protected]. Open: Click here for current open hours, days and dates. Directions: located West of Lima Road at the intersection of Huguenard Road and Wallen Road; Click here for a map and directions. Payment: Cash, Check. Click here for our Facebook page. Apples are available for U-pick on dwarf trees for easy picking. We also have already picked, brushed apples available inside our store for purchase, including Honeycrisp. Other products available at Cook's: fresh cider, apple butter, local honey, jams and jellies, vine ripe tomatoes, melons, pumpkins, squash, gourds, and sweet corn. In mid-August, we have already picked fresh Red Haven peaches for sale. In late August we have fresh pears available to pick. Comments from a visitor on August 28, 2010: "Large variety of apples availableincluding: Honeycrisp, Gala, Fuji, Mutsu, Jonagold, Cortland, McIntosh, Jonathon, Red Delicious, Golden Delicious, Empire, Rome, Northern Spy, Granny Smith, Arkansas Black, Spartan, Gold Rush, Braeburn, Lura Red, Paula Red, Ida Red, Lustre Elstar, Stayman, and more!, ick your own apples or choose from a large variety of already picked apples on display in store room. Also have available: tomatoes, pumpkins, gourds and a large variety of jams and jellies. " 9340 E County Road 800 N, Twelve Mile, IN 46988. Phone: 574-664-3861. Email: [email protected]. Open: Monday through Saturday by appointment only; No Sunday sales. Directions: From US 31 go west on State Road 16 for 3 miles to County Road 1000E. Turn right (north) on 1000E for 1 mile and turn left (west) on County Road 800N. Go 3/4 mile to 1st house on left. From Twelve Mile, go 1 mile east on State Road 16 to County Road 900 E. Turn left (north) for 1 mile to County Road 800N and turn right (East) for 1/4 mile to 1st house on right. Click here for a map and directions. Sweet corn and green beans available from late June through September. Payment: Cash, Check. P.O. Box 284, 6943 E. 1400 South, Galveston, IN 46932. Phone: 574-699-7600. Email: [email protected]. Directions: 2 miles west of Galveston at the intersection of Cass County roads 1400S and 700E. Open: 8 am to 8 pm April 15 to June 1. 1810 CR 51, Waterloo, IN. Phone: 260-837-7485. Open: Call for specific times. Directions: Located approximately 4 miles north of Waterloo off State Road 427 towards Hamilton. Watch for signs. Comments from a visitor on July 18, 2008: "We loved it. It's a good size patch for this area." Comments from a visitor on August 16, 2008: "We visited the Blueberry Patch in DeKalb County on August 15th and the bushes are still loaded with ripening berries. The place is GREAT, the blueberries are great and the folks who own it are friendly and knowledgeable. Also, it's well marked. Just follow the signs. We had a wonderful time. Carol in Auburn, Indiana"
19498 CR 38 , Goshen, IN 46526. Phone: 574-533-6311. Fax: 574-533-1685. Email: [email protected]. Directions: 1/4 mile west of State Road 15 on CR 38(Kercher Rd)19498 CR 38, Goshen, IN 46526. click here for a map and directions. Crops are usually available in May, June, July, August, September, October, November, December. Open: Monday to Friday, 8:30am to 5:30 pm, Saturday 8:30am to 4pm, open Sundays in September and October 12pm to 5pm. Morel mushrooms are available in May. Sweet Cherries and tart cherries mid June to early July. U-Pick Apples- Late August to late October. U-Pick Pumpkins and Hayrides, every weekend from the last weekend of September through the last weekend in October. Harvest festival the first weekend in October. Payment: Cash, Check, Visa/MasterCard. Specializing in homemade and locally grown Indiana products, including fruits and vegetables. The best darn cider and apple butter anywhere...that's what all of our customers tell us anyway!!! Fruit baskets beautifully designed with the best of the years fruits topped off with nuts and candies, little jars of jam or apple butter cheese, fudge and caramel apple dip, wrapped in cellophane and topped off with a festive bow. 6254 W. 200 North, Rochester, IN 46977. Phone: (574) 223-6632. Email: [email protected]. Open: Monday through Friday 8 am to 6 pm; Saturday 8 am to noon. Directions: SR 14 west of Rochester to CR 500, north 2 miles to CR 200W 1 one quarter miles. Blueberries (U-pick and prepick), honey. 780n 500w, Huntington, IN 46750. Phone: 260 388-5061. Email: [email protected]. Open: 11 am to 6 pm daily. Directions: If you are driving south, get on 9 to 100 North and turn right. Go to next cross road, 500 West, and turn left. Go to the second driveway on the right and turn in there. You have arrived. If you are driving north, get on 9 to W. Division Road and turn left. Go to next cross road, 500 West, and turn right. Go past the house and the barn with a red roof, go to the next driveway on the left and turn in there. You have arrived. There are also signs you can follow. Click here for a map and directions. Payment: Cash, Check. 713 15th Avenue NW, Demotte, IN 46310. Phone: 219-987-2424. Email: [email protected]. Open: Monday to Thursday 7 am to 6 pm; Saturday and Sunday from 7 am to 5 pm; closed Sunday; July 4 to August 8. Directions: I-65 South to IN 2 Exit (Lowell), Go 5 miles east (left) to US Highway 231. Go South (right)over Kankakee River and exactly three miles past river take first road to the west (right). Go one half mile on 15th Avenue (also called 1400 N.) You will see the farm on the left hand side of road. Watch for signs! Or check out our website for more directions. Click here for a map and directions. Payment: Cash, Check. We also have lots of blueberry goods: Blueberry jam, jelly, syrup, honey, and even blueberry BBQ Sauce and blueberry mustard, coffee, teas and jerky! Blueberry season varies each year so check out our website for updates and opening days and hours. Please bring your own take home containers for pick your own berries. We sell ready picked berries in convenient 3 lb., 5 lb., and 10 lb. containers. Please call ahead and place your order for ready picked berries to guarantee your pick up date and time. 13340 N. 700 West, DeMotte, IN 46310. Phone: 219-866-2388. Directions: 1.75 Miles North Of Ind highway 10 On 700 W. Click here for a map and directions. Crops are usually available in July. Open: Call for times. Payment: Cash, only. 10301 North State Road 10, Demotte, IN 46310. Phone: 219-987-2228. Alternate Phone: 219-987-5117. Fax: 219-987-7111. Open: Directions: Exit I-65 at route 10-exit 230. Go east on 10 about 3 miles. follows signs for 10. Turn left when Route 10 turns north(by big John Deere building)Go north about 1&1/2 miles to farm on right. Follow signs. Payment: Cash, only. 725 E. 1400 N., Wheatfield, IN 46392. Phone: 219-956-3356. Fax: 219-956-2704. Open: from 7 am to 6 pm, 7 days a week. Directions: Click here for a map and directions. Blueberries are usually available to pick from July 4th through August 5. We also sell preserves, honey and syrup. Payment: Cash, Check. 2666 W. St. Road 10, Wheatfield, IN 46392. Phone: 219-956-3687. Email: [email protected]. Directions: 2 one half miles west of SR 49 on SR 10 or 6 miles east of DeMotte on State Road 10. Open: Monday through Saturday 7 am to 6 pm. Call for seasonal pricing for blueberries. U-pick and pre-picked blueberries available for purchase. Also honey, jams, jellies, and juices are available for purchase. Comments from a visitor on July 08, 2009: "The staff at the farm is very friendly and helpful. Alice "The blueberry Lady" is as sweet as can be and very helpful. She even checked on us a few times while we were picking. We go back every year to pick from this farm." Zylstra's Blueberries - Blueberries u-pick and ready picked. 11881 W. 1200 North, DeMotte, IN 46310. Phone: 219-987-2061. Email: [email protected] Open: at 7 am; closed Sundays; Available July 5 to August 10. Directions: Take I-65 to exit 230 & turn west; or take I-65 to exit 240 & turn east. Follow signs to farm. US 30, Warsaw, Indiana 465824. Phone: (574) 527-2317. Email: [email protected]. Open: Sunday from 2pm to 6pm and Monday thru Saturday from 7am to 8pm. Directions: 8 miles west of Warsaw on US 30. Call for directions. Strawberries are available in June; Blueberries follow the strawberries and are typically ready in early July. Payment: Cash, Check. Click here for our Facebook page. Formerly known as The Pickin Patch. Under new ownership and management since 2011 as The Berry Patch. U-pick and Ready picked strawberries and blueberries. Children welcome. 9139 N 300 E, Syracuse, IN 46567. Phone: 574-742-2247. Email: [email protected]. Open: Click here for current open hours, days and dates. Picking updates: Click here for picking updates. Directions: Intersection of 300 E and 900 N on Dewart Lake. Warsaw: North on SR 15. Turn Right on 900 N. Travel east for 3.5 miles until it "T's" into 300 E. Turn left. Farm located on left side. Goshen: South on SR 15. Turn left on US-6 for 3 miles. Turn right on CR-127 (turns into 300 E). Travel south for 5 miles, farm will be on the right side. Click here for a map and directions. Blueberries: July 11 to Sept 1, Blackberries: End of July-End of September. Payment: Cash, Check, Visa/MasterCard. Click here for our Facebook page. 5975e 500n, Leesburg, IN 46538. 5017 Armstrong Road/ CR 500 N, Leesburg, IN, 46538. Phone: 574-834-1164. Open: for U pick- 7:30 am to 12:00 noon and 3:00 pm to 6:00 pm. Portapotty on site, shelter on site. Directions: Located across from Shoe Lake to the north side Payment typically taken on site- farm stand 1/4 mile west on south side of road at intersection of CR 475 E Not sure if crops are organic. Other: prepicked corn, green beans . Comments from a visitor on June 02, 2012: "They don't allow children under 8 years old. We found out when we arrived." 8171 West 300 North, Etna Green, IN 46524. Phone: (574) 858-9451. Open: We are open seasonally when crops are ripe; call for hours; We are closed when it is raining. Directions: 8 miles west of Warsaw off US 30. Turn north onto County Road 800 West and follow the signs. Click here for a map and directions. U-Pick Strawberry and Blueberry Farm. Strawberries are available in June; Blueberries follow the strawberries and are typically ready in early July. Payment: Cash, Check. U-pick and Ready picked strawberries and blueberries. Children welcome. Click here for our Facebook page. 200 County Line Road, Hobart, IN 46342. Phone: 219-947-4477. Fax: 219-947-7933. Email: [email protected]. Open: click here for current hours and dates. Directions: We are located 33 miles SE of Chicago. Exit 80/94 at Ripley, go south to Rte 6, go east to County Line Rd - turn right on County Line Road. We are 1 mile on the Right hand side of the road. Easy access from I-65 - exit at Rte 6 and go east to County Line Rd - turn right on County Line Road ! mile on the right hand side. Payment: Cash, Check, Visa/MasterCard. County Line Orchard is family owned and operated. In addition to apples and pumpkins we have a Kid's Farm, 8-acre corn maze, haunted trail, country store and kitchen with some of the best homemade apple cinnamon donuts in Lake County. 6716 South Colorado Street, Hobart, IN 46342. Phone: 219-947-0223. Email: [email protected]. Directions: 6716 Colorado Street, Hobart IN 46342 - From US 30 near Westfield Shopping Center - Turn North (At Walmart) onto Colorado Street from US 30, continue 1.5 miles over RR Tracks, our farm is on the left. From 61st Avenue and I-65 Intersection, Head East 1 mile until Colorado St, Turn Right 1/2 on right is our farm. Click here for a map and directions. Crops are usually available in May, June, July, August, September, October. Open: during normal business hours, 7 days a week (Seasonal). We minimize use of pesticides and other chemicals. Payment: Cash, only. Seasonally a vendor at the Crown Point Farmer's Market, Schererville Farmers Market, and as always pre-picked produce is available at our farm or for u-pick. A visitor writes on July 09, 2013: "My cousin and I came here this past Sunday. They had tons of giant blueberries! The staff was very nice and the prices were reasonable. They also had fresh eggs for sale. Very convenient location for people living in Gary/Chicago. We'll come back next year!" 2411 E. 109th Avenue, Crown Point, IN 46307. Phone: 219-663-4782Directions: Take I 65 to the Crown Point exit #247. Go east on StRd 231 toward Hebron to the flashing yellow light. Turn left (north) onto Iowa Street. Go approximately 2 1/2 miles through the 4 way stop to the farm entrance just before the red building. Click here for a map and directions. Crops are usually available in August, September, October. Open: Tuesday to Saturday from 9 to 5; Sunday 10 to 4; Closed on Monday Open mid August to October 31. Payment: Cash, Check. Picked rhubarb and asparagus available in the spring. 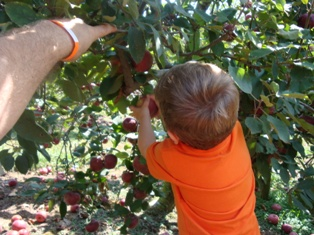 Comments from a visitor on September 30, 2011: "I will never take my child to the Maurys apple orchard in crown point indiana. They were the absolute rudest people i have ever met! They acted as if the children were a nuisances to them. They yelled at the children repeated amount of times about playing in the hay. To the point they made a little girl cry. She walked up to the little girl ripped the hay out of her hand through it on the ground and in her face said, "I am not going to tell you or anyone else to stop playing with the hay". The most ridiculous thing i have ever seen. It was a field trip for my sons pre-k class, it is 3 and 4 year old, newsflash you have hay they are going to play with it they are really not the interested about u telling them about a piece of farm equipment or certain apples!!!! the attention span is not that long! then the other female under the blue tent screamed about the hay as well saying she was allergic, well why be around hay if that's the case. Also, she threatened the kids to tell there parents to keep it quiet as well!!!!! Parents were so angry they grab there children and left and the rest of us including the parents were walking on egg shells! i can believe these people work with children everyday!!!!!! " 2056 West 1000 North, LaPorte, IN 46350. Phone: 219-326-8712. Notes: I haven't seen an update for this farm in 10 years, so I suspect they are closed. Has anyone been by there? Alkos, the other websites merely copied my information, so don't count on those! 650 Frey Road, Michigan City, IN 46360. Phone: (219) 872-7477. Open: Wednesday to Monday; 8:30 am to 6 pm, closed Tuesday. Click here for current open hours, days and dates. Directions: Take Chicago Skyway/Indiana Toll Road to Lake Station Exit 94 East Towards Detroit to Michigan City Exit 40B Take 20 35 North For 1/2 Mile To 212 North Take 212 North to Freyer Road (approximately 3 miles) Left onto Freyer Road for 3 blocks. Click here for a map and directions. Payment: Cash, only. Make sure to call ahead and reserve your ready pick blueberries. Self Pick also available. Comments from a visitor on July 11, 2010: "They opened 7/9/2010, and are in business!" Comments from a visitor on July 09, 2010: "I called them today and they are open this weekend. " Comments from a visitor on June 29, 2010: "We live only 15 miles or so away. We went at least twice in early August 2009 and picked from heavily bearing bushes each time. We will continue patronizing Billy Boy's farm until we have 10 or more blueberry bushes of our own that are in full production (probably 4+ years)." 15552 S. 1050 W., Wanatah, IN 46390. Phone: 219-733-2416. Email: [email protected]. Directions: from chicago: I-80 or I-90 into Indiana, exit at US 421 South, 3 miles after CROSSING US 30 you will see sign on Right, turn Right onto 1500 S, turn Left at stop sign onto 1050 W, go one half mile & farm is on the right. from Indiana: US 30 East 7 miles past Valparaiso, turn South onto US 421, go 3 miles & turn Right onto 1500 S, turn Left at stop sign onto 1050 W, go 1/2 mile & farm is on Right. click here for a map to our farm. Crops are usually available in July, August. Open: 7am-7pm/7 days a week Payment: Cash, Check. Bring containers to transport berries home. 10352 N. State Road 39, LaPorte, IN 46350. Phone: 219-324-6335. Open: During Blueberry Season open from 9 am to 5:30 pm; every day except Tuesday (closed on Tuesdays). Directions: See their website for directions. Payment: Cash, Check. 2388 W 1000 N, Laporte, IN 46350. Phone: (219) 326-8686. Alternate Phone: (219) 326-8430. Email: [email protected] . Open: Daily 8 am to 6 pm but closed all day Tuesdays; Opening date depends on the season and is when berries ripen; This is late June to early July; Closing date is usually Labor Day; Call ahead for exact dates. Click here for current open hours, days and dates. Picking updates: Click here for picking updates. Directions: I94 Exit 1 in Michigan (LaPorte, Indiana / New Buffalo, Michigan), turn right (south)on Michigan Highway 239 and go 3 miles to County Road 1000 N, turn right and go 1.3 miles to the farm. You will see blueberry bushes and the signs on your left. Indiana Toll Road (I80&90) Exit 49 (LaPote), turn right on Indiana Highway 39 and go 8 miles north to County Road 1000 N and turn left,go 1.3 miles to the farm. Click here for a map and directions. We use integrated pest management practices. Payment: Cash, Check. Shady picnic area; walks and areas between bushes are carefully manicured. Trolly rides are available on weekends or when picking is a distance from parking. Home baked pies and pierogi available on weekends. This is a family farm in business since 1948. We have the newest varieties, as well as, the old heritage types. We are always looking for better blueberries and have more that 70 varieties. 9895 W. 1700 S., Lacrosse, IN 46348. Phone: 219-733-9080. Alternate Phone: 219-671-1889. Open: click here for current open hours, days and dates. Picking updates: click here for picking updates. Directions: click here for a map and directions. Payment: Cash, Check. 1776 North Wozniak Road, Michigan City, IN. Phone: (219) 874-6056. 8999 W. 200 N., Michigan City, IN 46360. Phone: 219-872-3140, Fax: 219-879-0411. Email: [email protected] U-pick apples. Directions: From I94: Take exit 34A (421 south), turn left at the second intersection past the exit. This will be County road 200N. We are approximately 1 mile down this road. click here for a map and more. Open: from 9 am to 6 pm mid-September through October. Mid-September through October. 9957 North Frontage Road, Michigan City, IN 46360. Phone: 219-874-7721. Email: [email protected]. Open: Monday to Friday from 8 am to 6 pm, Saturday and Sunday 7 am to 6 pm Central Standard time. Directions: In Indiana, take 80/94 East to exit 40 A, which is the us 20/ 35 exit. Stay on 20 going east. Drive until you reach Highway 39. Turn left. Drive exactly 3.9 miles to 925 N. You will see a big mahogany house with a white horse fence, this will be 925 N. Turn left and drive 2 more miles down the road. Turn on the first right and follow the road to the farm!. Click here for a map and directions. July through August; Best Blueberries this side of the Stateline. Payment: Cash, Check. We are 4 miles from the Sandy shores of Lake Michigan. It's our 10th anniversary. 10 years of fun family farming built on 67 years of tradition. Our motto: A fun family tradition!! Don't forget to bring the camera!. 2811 US Highway 31, Plymouth, IN 46563. Phone: 574-784-2905. Fax: 5874-784-2468. Email: [email protected]. Open: Monday to Friday from 8:30 am to 5:00 pm; Saturdays depending on yield and weather; please call to confirm before you come; Closed Rainy days and Sundays. Directions: We are on the west side of the road 1 mile south of the intersection of US 6 and US 31. Click here for a map and directions. Blueberries are typically ready in early July and picking continues through mid August. We have U Pick and Ready Pick blueberries; Bring a container to take u-pick blueberries home in; We do have some picking containers to pick in. Payment: Cash, Check, Debit cards, Visa/MasterCard, Discover. 3133w 300s Corner of Noble County roads 300S and 300W, Albion, IN 46701. Phone: 260-799-5772. Email: [email protected]. Directions: From Churubusco or Fort Wayne: SR33 North, go 1 mile past SR9, then turn left (West) onto 400S, turn right (North) onto 300W, then left onto 300S. From Columbia City: SR109 North to Noble County 300S, turn right (East),go 3/4 mile past brick farm house to orchard parking lot. From North of the orchard: SR33 South, turn right (South) onto 300W, go 1.2 miles to 300S, turn right. Click here for a map and directions. Crops are usually available in September, October, November. Open: Generally open Saturday 8:00am to 7:00pm, Sundays 11:00am to 7:00pm, and most weekday evenings; This is a small two person operation; Calling ahead is recommended; Self serve stocked refrigerator in parking lot is always open; 2nds (slight skin defects) at a discount are available for baking, sauce or eating. Payment: Cash, Check. Asian Pears. U-Pick only on late Fall apples. 28 varieties of apples. Some are heirlooms. 5393 S. 800 East, LaOtto, IN 46763. Phone: (260)-693-2080. Email: [email protected]. Directions: From Ari, 4 miles northeast of Churubusco on SR 205, go 1 mile west on CR 800E. Open: During season we are open Monday to Saturday from 7am to 8:30 pm, Closed Sunday, July through September. U-picked or ordered. Payment: cash, checks. 3472 W 800 N, Wawaka, IN 46794-9781. Phone: 260-761-2013. Open: June - hours vary. Directions: Call for directions. Payment: Cash, Check. Comments from a visitor on August 04, 2011: "Great - good picking, reasonably priced"
2469 W US 6, Wawaka, IN 46794. Phone: 260-761-4109 Click here for a map and directions. Crops are usually available in July, August. Open: Monday, Wednesday, Thursday, and Saturday 7am to Noon. Picking through July to mid August. Payment: Cash, Check. U-pick and Pre-picked berries available. Call for more information or to place an order at 260-761-3841 or 260-761-4109. 430 E. U.S. Hwy. 6, Valparaiso, IN 46383. Phone: 219-464-4936. Email: [email protected]. Open: Spring: Monday through Saturday, from 10 am to 6 pm; Sunday, 11 am to 5 pm; Winter: Tuesday though Saturday from 10 am to 5 pm; Sunday 11 am to 4 pm; June through November.Directions: 3 one half miles east of SR 49 on Hwy. U.S. 6. 624 E 950 N, Westville, IN 46391. Phone: 219-929-1763. Email: [email protected]. Open: Wednesday 12 pm to 5 pm; Saturday 10 am to 4 pm, May 15 to October 15. Directions: Click here for a map and directions. We use natural practices, but are not yet certified Organic. Payment: Cash, only. 641 East State Road 2, Westville, IN 46391. Phone: 219-688-4753. Email: [email protected]. Open: June, July and August 10:00am to 4:00pm Saturdays and Sundays. Directions: 641 East State Road 2 Westville, IN 46391. Daylilies: June, July and August. We use natural practices, but are not seeking organic certification. Payment: Cash, Check. Family owned Farm. We raise and grow everything as natural as possible. All of our animals are free range on pasture. We sell Black Angus Beef, Chicken, Pork, Fall Turkey, Honey and Maple syrup. We have Daylilies plants for sale with over 500 different varieties to choose from. 65681 Sycamore Road, North Liberty, IN 46554. Phone: 574-656-3376. Email: [email protected]. Open: daily from 9:00 am to 6:00 pm during the apple season, September and October. Directions: One (1) mile East of North Liberty, IN and 2 1/2 miles West of Potato Creek State Park to Sycamore Road. Click here for a map and directions. Payment: Cash, only. Beech Road Blueberry Farm - U-pick blueberries, honey. 54743 Buckeye Road, P.O. Box 647, Granger, IN 46530-0647. Phone: 574-255-5773 . Email: [email protected].Directions: 5 miles east of Grape Rd/ University Park Mall. Exit 83, Indiana Toll Road, south to Cleveland. East to Buckeye. The blueberry crop is 100% certified organic. Our first organic field was certified in 1991. . .
28420 Quincey Road, North Liberty , IN 46554. 19000 New Road, South Bend, IN 46614. Phone: 574-231-9114. Alternate Phone: 574 339 7002. Email: [email protected]. Open: Daily 9am to 7pm, or by appointment. Directions: First paved driveway on south side of new road west of Miami road. Click here for a map and directions. Vegetables, eggs, chickens, ducks, rabbits year around as seasons allow. We use natural practices, but are not yet certified Organic. Payment: Cash, only. Eggs and meat from rare breeds, including Welsh Harliquen Ducks and Champagne d'Argent rabbits. 3655 S 750 W, North Judson, IN 46366. Phone: (574) 896-5365. Email: [email protected]. Open: 7 days a week from 7am to 6pm. Directions: 2 one half miles north on 750 W off of highway 10, west of North Judson. Click here for a map and directions. Payment: Cash, Check. Mid July to mid August. A visitor writes on January 30, 2014: "My wife and I went there in August 2013. They also offered honey. This is one of the best organized you-picks we've visited. The attendants (for want of a better term) escorted us to a part of the farm where we would avoid bumping into other pickers." 3340 South 750 West, North Judson, IN 46366. Phone: 574-896-2283. Email: [email protected]. Open: Daily 7 am To 6 pm During blueberry season. Directions: Located 2 and one half miles north of highway 10 on 750 west in North Judson (starke county). Click here for a map and directions. Blueberries : July 1 through mid to late August. Payment: Cash, Check. Third party audited for food safety and security. Ready picked blueberries available as well as u pick. Please, no pets allowed. Family owned and operated. 5865 S. 600 W. Route 10E and 600 W, North Judson, IN 46366. Phone: 574-896-9262. Email: [email protected]. Click here for a map to our farm. Crops are usually available in July, August. Open: Monday to Friday 7:30 -6 pm, Saturday and Sunday 8:00 to 5:00 pm Blueberries open July 7-end of August Payment: Cash, Check. We have fresh eggs: brown and "Easter egg colors" There are quilts for sale and other handcrafted items as well as photography. Come see ! 9624 W 75 S , West Lafayette, IN 47906. Phone: 765-583-2425. Email: [email protected]. Open: Call for dates, times, and conditions. Directions: From Lafayette IN. Take South River Road 10 miles to the Ravines Golf Course. Turn left and follow signs. One quarter mile past the Ross Camp. Click here for a map and directions. Crops are usually available: Sweet Cherries June 5-22 Blueberries June 25-July 20th Peaches July 27-Aug 20th. Payment: Cash, Check. 3549 Prophetstown Trail, West Lafayette, IN 47906. Phone: 765-567-4700. Email: [email protected]. Open: 7 days a week, 8 am to 5 pm. Click here for current open hours, days and dates. Directions: Click here for a map and directions. Payment: Cash, Check, Debit cards, Visa/MasterCard, Discover. Click here for our Facebook page. 4840 Hawthorne Ridge Drive, West Lafayette, IN 47906. Phone: 765-463-4215 - Directions: Go north on Salisbury Street in West Lafayette, Indiana to the city limits and then one mile north or about one half mile south of Harrison High School on County Farm Road. Follow the white blueberry signs to the farm and the parking area. Open: Monday to Friday 5:30 pm to 9:00 pm and Saturday 8:00 am until 1:00 pm, in July and August. 4604 Pretty Prairie Rd, Battle Ground, IN 47920. Phone: 765-567-2750. Email: [email protected]. Open: Sweet corn Monday to Saturday from 11 am to 6 pm July 1 to August 30 Pumpkins and vegetables call for open times. Directions: Click here for a map and directions. We use natural practices, but are not seeking organic certification. Payment: Cash, only. 9632 E. 350 S., Lafayette, IN 47905. A visitor writes on September 13, 2013: "They are Supper accommodating and my kids LOVE to go there!! They encourage you to pick fruit right off the trees and eat it!! " 7877 W 400 N, Wabash, IN 46992. Phone: 765-833-6122. Email: [email protected]. Open: Tuesday through Saturday 1 pm to 6 pm for already picked fall fruit; Closed Sunday and Monday; Strawberry season hours vary, but we are always closed on Sunday. Picking updates: Click here for picking updates. Directions: 2 miles south and 1 mile west of Roann, In. Open: Monday to Saturday, always closed on Sundays. Phone: 765-833-6122. Payment: Cash or check. No credit cards accepted. Click here for a map and directions. Call ahead for updates; Strawberries around June 1st; Apples early fall (call - our PYO apples ended in 2010, after that we have already picked apples only). We also have ready-picked apples, pears, Asian pears; also apple butter, and cider in season.